Bryngrim is a Nord barbarian located either just east along the coast, near the mouth of the Iggnir River, or inside the mine in Raven Rock. He is one of a group of mercenaries under the command of Toralf. 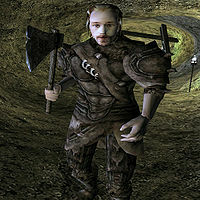 Bryngrim can first be found in the Hirstaang Forest wearing a common shirt with matching pants and shoes. When Raven Rock mine is attacked by Bryngrim and his cohorts, he adds a bear cuirass with matching greaves, both bear pauldrons, and boots. He carries a huntsman war axe. Aside from his natural resistance to shock, immunity to frost, ability to shield himself, and a natural frost damage spell, he knows no spells. "Carnius sent you, eh? Talk to Toralf." "Passin' out the equipment? Hand it over, then." "What makes you think I want to chat with the likes of yeh?" "Bah! Come back when yeh actually have the armor and weapon yeh're supposed to give to me." "What? Yeh gave me the equipment already. I ain't here to chat with yeh." This page was last modified on 3 February 2018, at 13:53.